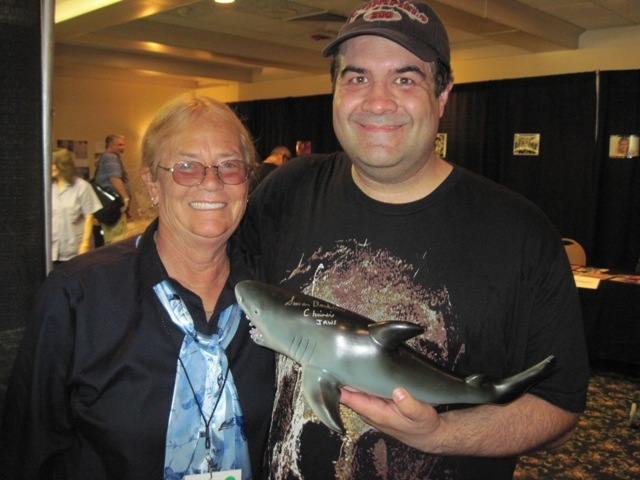 Meeting Susan Backlinie: Killer Shark JAWS’ First Victim! Upon entering the mosh pit (a.k.a. the celebrity room at FRIGHT NIGHT) I was worried that there would be a long line to see Susan Backlinie. Not familiar with that name you say? Don’t worry, you have DEFINITELY seen her before. 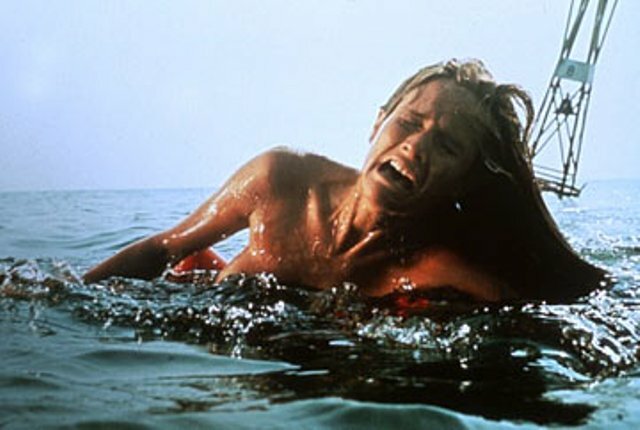 She is the woman who has the dubious distinction of being JAWS‘ first kill. That 70’s “free love” gal who, after receiving a drunken nod from a stranger, quickly sheds her clothes and invites him for a skinny dip. Running playfully down the beach, she dives headfirst into the ocean….and directly onto the dinner plate of cinema’s most famous shark! Thankfully, Miss Backlinie had a large banner of the movie JAWS behind her and, unlike many of the celebs, was easy to find. Also unlike the other guests I was shocked to see her sitting ALONE! I had assumed that any alumnus from the world’s first blockbuster would have been a draw. 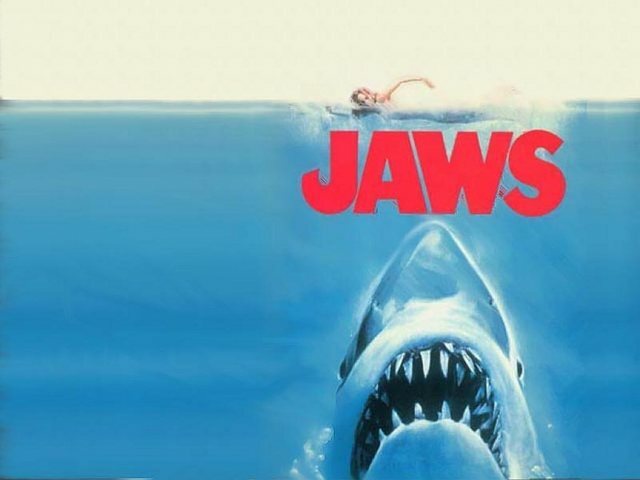 After all, this is JAWS we’re talking about! 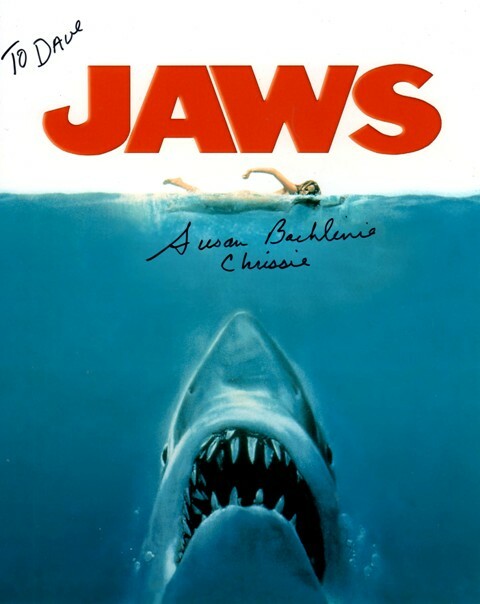 A movie that still stands as one of the greatest films of all time and made “Steven Spielberg” a household name. If someone told me that they had played one of the “extras” on the beach when young Alex Kintner gets devoured, I’d want a picture with them! Of course I understand we aren’t talking about Richard Dreyfus here but the fact remains that, of all the people in that room, she was the lone actress in one of the most famous scenes in one of the most famous movies of all time! Instead I see her sitting all by herself with a group of fans fluttering around the cast of REVENGE OF THE NERDS! Call yourselves horror fans!?! Susan Backlinie turns a cheesy rubber shark into cool horror collectible! This entry was posted in Celebrity Encounters!, Convention & Expos, Man vs Nature! 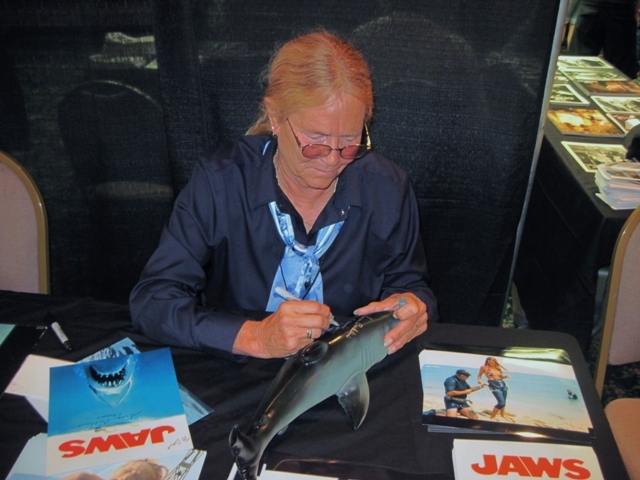 and tagged JAWS, Susan Backlinie. Bookmark the permalink. i worked stunts back when that movies was made. I wasn’t in that one but i met Susan Backlinie few times. She was very hot back then. i looked her up the other day just because i thought about that show and found her today. WOW is all i can say. Thanks for the comments…you must have some great memories and stories from your time doing stunt work.